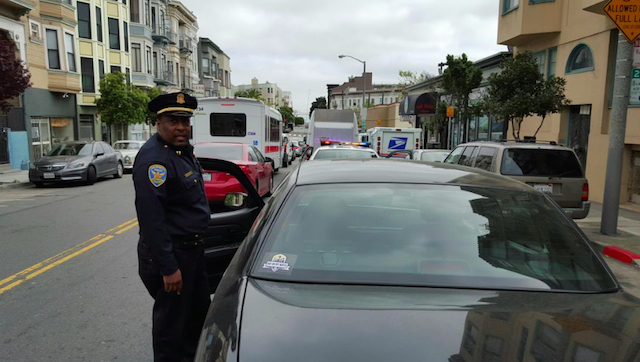 San Francisco Police Department's Park Station busted a driver with a car full of weed on Friday during a "Vision Zero" operation. In the middle of their new pedestrian safety stings — a project that aims to ticket speeders, red light and stop sign violators, and those who fail to yield to pedestrians — they nabbed a vehicle brimming with kind bud. According to the Park Station newsletter, "Officers not only were able to issue 18 citations during the operation, they also stopped a driver who was transporting several pounds of marijuana in his vehicle leading to a nice little drug bust!" The bust happened at Scott and Duboce. An arrest was made. And we are all safe from the scary bags of cheap-looking ganja. For now. Hey, speaking of pedestrian safety, can SFPD get someone to bring down the Razor and electric scooter mafia riders in SOMA and South Beach? It's a problem. These deplorable human beings ride on the sidewalks, pedestrian safety and legality be damned. Thanks.